1. Search for the drug(s) you would like to order in the search box below. 2. Choose the desired dosage and quantity and follow the easy instructions to complete your order. Order by phone - Call us toll-free at 1-877-244-0429. Our Customer Care Specialists will help you with every step. You can call during regular business hours (Monday to Friday, 6 am - 8 pm and Saturday to Sunday, 7 am - 5 pm PST). Be sure to have your prescription information handy. NOTE: Please leave your phone number. During Business hours. please leave your name, area code, phone number, and email address so that we can contact you as soon as possible. CLICK HERE FOR FAX / MAIL ORDER FORM. 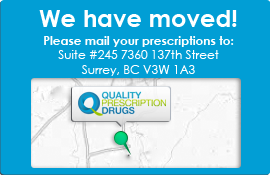 Complete and sign the form and send to Quality Prescription Drugs with a copy of your original prescription(s). Your prescription will be verified by Quality Prescription Drugs with your physician's office. A Customer Care Specialist will contact you to confirm your order.